Parents helping their ESL children learn English is a multi-faceted process. Small steps combine to create an eager and capable student. Parents must first understand and believe in the importance of English language skills. Children are adept at picking up on parental attitudes. If children realize the adults in their lives don't think learning English is important, they will be less likely to approach the subject with a positive attitude. Talking to teachers and other school personnel can be intimidating for parents of ESL students, especially if they aren't comfortable with their own English skills. However, teachers can be invaluable partners in helping children reach their full potential. In addition to reporting on a student's overall progress, teachers may be able to suggest the best methods for practicing English at home and point parents to helpful resources. Parents who are unable to speak to a teacher in English should investigate whether the district or a community program offers translators or ask a fluent friend or family member for assistance. One of the greatest ways for parents to help their children learn English is by attempting to learn English themselves. When parents are able to use English at home, more opportunities will arise for children to practice speaking and listening. Parents and children practicing their new skills together can be a great motivator. Even parents who are fluent in English can demonstrate the importance of learning by focusing on an area of improvement, such as studying a difficult novel to learn complex vocabulary or bettering their writing skills. Reading is an invaluable skill that only improves with practice. Parents can help by providing access to books and reading aloud to their children. While it's important to practice reading in the target language, not every book must be in English. Reading in their native language can help students preserve their culture while also improving their overall reading fluency. Students who read well in another language are more likely to experience success in English literacy. No matter what their background or personal English abilities, by making a dedicated effort to promote English language learning, parents of ESL students can be the key to a child's success. "How Parents Help Their ESL Children Learn English." YourDictionary, n.d. Web. 21 April 2019. 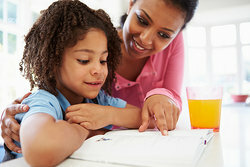 <https://esl.yourdictionary.com/about-esl/how-parents-help-their-esl-children-learn-english.html>.